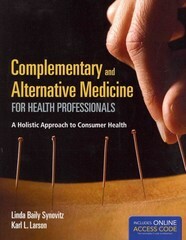 Complementary And Alternative Medicine For Health Professionals 1 Edition Highly Researched And Referenced, Complementary And Alternative Medicine For Health Professionals: A Holistic Approach To Consumer Health Educates Students About The Many Complementary And Alternative Medicine (CAM) Modalities That Are Available, In Addition To The More Traditional Methods That Exist. Early Chapters Provide An Overview Of Both Traditional And Alternative Medicine, Scientific Method And Steps In Scientific Research, And Look At The Cost Of Health Care In The U.S. Later Chapters Introduce Students To Integrative Medicine And Provide A Thorough Overview Of CAM Practices Employed Today. Topics That Are Covered Include Acupuncture, Meditation, Herbals And Aromatherapy.By Reading This Text, Students Will Become Astute At Distinguishing Among Those Traditional And CAM Health Practices That Are Helpful, Those That Have Been Scientifically Tested, And Those That May Offer No Benefit.